A candidate for Russia's presidential elections linked to self-exiled tycoon Boris Berezovsky has disappeared, according to family and colleagues. Ivan Rybkin, a senior official under former president Boris Yeltsin, has not been seen since Thursday evening. Police launched a hunt for Mr Rybkin on Sunday after he was reported missing, but a spokesman said there was no reason to suppose he had been abducted. Mr Rybkin is a harsh critic of Vladimir Putin who seeks re-election. The number of candidates challenging Mr Putin has now risen to six after two more were approved by the electoral commission before a Sunday deadline. Most of Russia's best-known political names bowed out of the presidential race after Mr Putin's United Russia party and its allies swept last December's parliamentary elections. 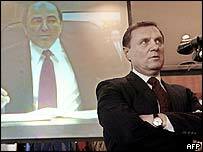 Mr Rybkin is best known as a speaker of the Russian parliament and head of the national security council during the Yeltsin era in the 1990s. In recent years he has called for talks between the Kremlin and Chechen rebels on ending the fighting in the republic, but Mr Putin is opposed to any negotiation. He currently leads a faction of the Liberal Russia party, formed by Mr Berezovsky, and is seen as close to the UK-based tycoon. He ran a full-page open letter in the newspaper Kommersant this week claiming to have information linking President Putin to big business. But his campaign has failed to take off, and polls show his support running at about 1% of the electorate. Nationalist Sergey Glazyev, seen as the biggest threat to Mr Putin, is expected to be approved as a candidate on Sunday.